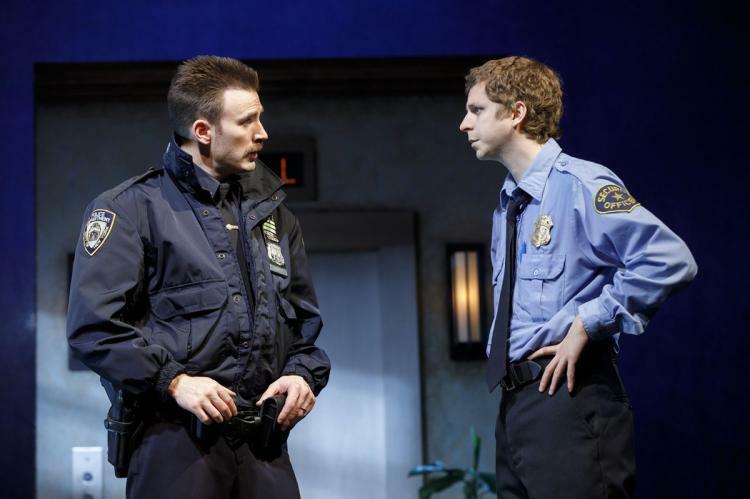 Bill (Chris), one of New York's not-so-finest, and Jeff (Michael Cera), a high-rise security guard, don't see eye-to-eye in "Lobby Hero." First, the theater. The Helen Hayes has been acquired by Second Stage, somehow lost the Helen, and undergone a needed renovation. The Hayes, at 597 seats Broadway’s smallest house, was always cozy, but also always musty. Now it has plush burgundy seats, royal blue walls embroidered with classic figures, and more legroom than some larger houses. It’s spiffy and well-proportioned, and about all it lacks is a real lobby. But there’s one onstage, as its initial tenant is Lobby Hero, Kenneth Lonergan’s 2001 comedy-drama, but mostly comedy. Lonergan, here as in This Is Our Youth and Manchester By the Sea and several other works, is focused on people who make bad decisions, and the consequences of those decisions. The lobby of the title, of a Manhattan apartment building, was designed by David Rockwell, and it’s one of the least impressive sets of the Broadway season, a sparse space that pointlessly rotates during scene changes. But the four people who inhabit it—four and only four, as Lobby Hero takes place over the middle of several nights, when foot traffic in the lobby is scant—deserve our attention. They’re spectacularly misguided, they embody much of what’s wrong with American values, and above all, they’re funny. Dawn (Bel Powley), his neophyte partner, an insecure trainee and the object of Jeff’s considerable sexual fantasies. She’s in trouble for having just beat up a perp, and not indifferent to Bill’s overtures, until Jeff tells her Bill’s been boffing a tenant upstairs. The play's cast, from left, Brian Tyree Henry, Bel Powley, Michael Cera and Chris Evan are a fine-tuned ensemble under the direction of Trip Cullman. Some caveats: The play just ends, practically in midsentence and with much unresolved, though maybe that’s Lonergan’s way of saying, Life is like that. And there’s a certain condescension around the edges: These people are blue-collar, his writing keeps reminding us, but he isn’t. (This was also apparent in Manchester By the Sea.) 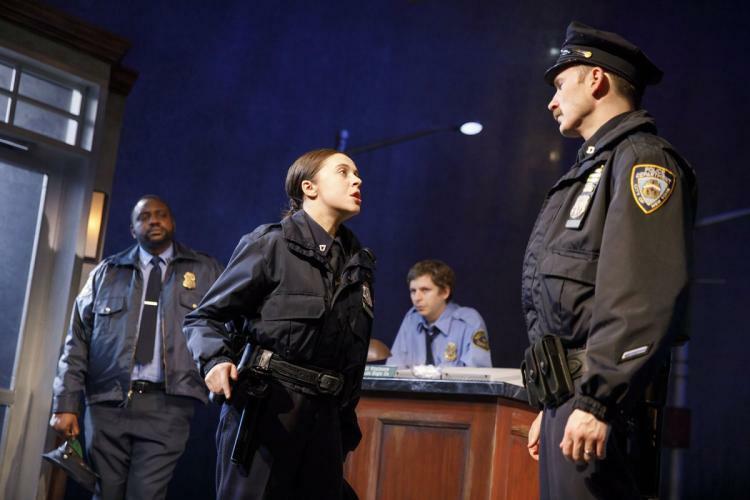 But Lobby Hero remains a funny, disturbing look at how some people, in whom we frequently recognize ourselves, run away from the truth, comfort themselves with unreachable goals, and cross over too quickly into moral compromise when faced with unpleasant possibilities. It’s a full, entertaining evening of conventional theater. And it’s happening in a beautifully refurbished house. At the Hayes Theater, 240 W. 44th St., Manhattan. For tickets, visit Telecharge.com or phone (212) 239-6200. Running time: 2 hours 20 minutes with one intermission.